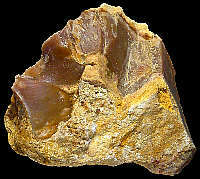 Material (geologic): Late Cretaceous (Senonian) flint. Mode of occurrence: Small nodules and fragments of tabular flint. Cortex: 5 mm thick, worn, rough and pitted, reddish yellow, transition sharp and marked by a thin brown line (iron oxides); pale thin concentric banding immediately below the cortex due to the outward migration of large quantities of sponge spicules. Colour: Reddish brown (7.5YR 4.5/2). Pattern: Featureless (rare 5 mm patches of unreplaced matrix, 1 to 2 mm concentrations of skeletal grains and carbonaceous matter). Appearance: Very homogeneous material with a shiny to medium lustre, subtranslucent, smooth, fine-grained. Texture: Mudstone, to very locally wackestone. Grains: 5 to 7.5 % (locally 15 %), skeletal grains and carbonaceous matter, pale-coloured or stained by iron oxides, subangular to rounded with high sphericity, regularly distributed and contained between 50 and 125 µ; fuzzy irregularly shaped elements of 250 µ. Grain composition: Rare very small globose and biserial planktonic foraminifera, benthic foraminifera (Nodosaria sp. ), thin-walled sponge spicules, bryozoan fragments (? ); abundant carbonaceous elements, frequent iron oxides. Co-ordinate precision: The coordinates given were taken from a large-scale map, and won't be off by more than 50 metres. The latitude/longitude coordinates are a direct transformation of these data on WGS84 and are accurate to the same level, so give or take an arc-second or two. The location can be found on the 1:25 000 topographical map sheet 3231 E of the French Institut Géographique National. Geology: According to the geological map, the substrate is of Oligocene age (unit 'g'). 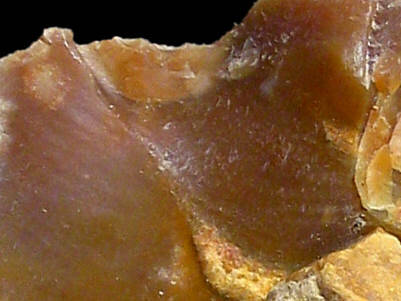 The flint istself originates in Late Cretaceous (Senonian) sediments and lies here in a secondary position.